-this is the FIRST time I've done a skin. I have only just got into it and probably won't even delve too deeply, so if there are any flaws, please tell me about them! The most notable will probably be with the Bronze Green version of the Firefly, as though I have tried to make sure items such as shovels on the tank or the canvas retained their original colours, I may have missed a bit or two. If I have, try to take a screenshot of it so I know what to look for! Saying that, I'm only really trying to match the most obvious stuff, such as, well, the shovels and such. Not everything. -the Bronze Green version of the Firefly is part of a larger thing that, at the moment, I'm still working on. Of course, having changed the base colour of the tank, the camouflages may appear different and especially if you have for example downloaded my Camouflage pack mod, some of them may look significantly different. Here is a video courtesy of a member of my former clan, Strappster, showing the different camos used on the Bronze Green version of the Firefly. I'll post the video a second time lower down in the thread. 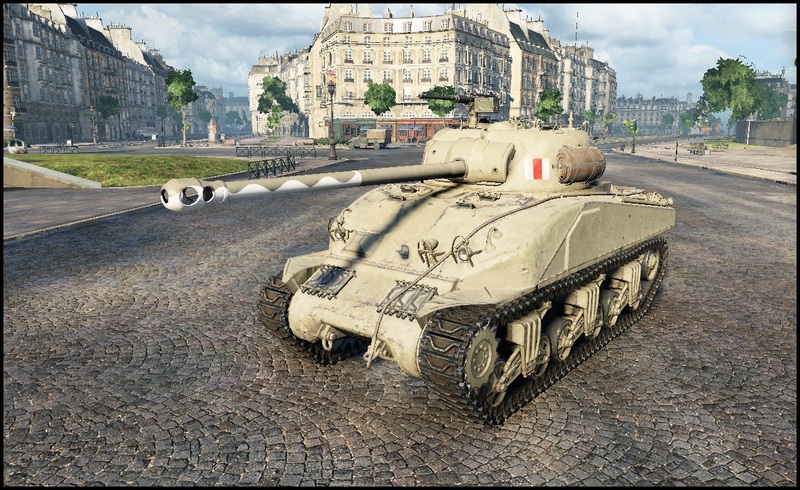 Oh, and the White Barrel paint only affects the two 17pdr guns; the QQF 17-pdr Gun Mk. IV SH-SH and the QQF 17-pdr Gun Mk. VII. Additionally, Marks of Excellence will somewhat affect the appearance of the white paint. Nothing I can really do about that but suggest turning off MoEs if they're bugging you. 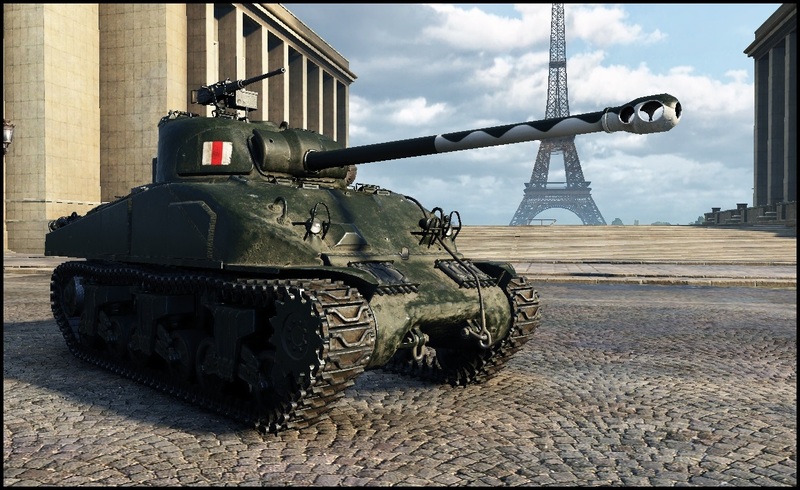 -a skin for the Firefly that adds the "camouflaged" barrel to both 17pdrs for the Firefly. The "camouflaged" barrel is loosely based off of this, which I believe was applied to the barrel to try to make it harder for German tanks to identify the Firefly as they were a higher value target than the regular Shermans. There are two versions of this; one that only adds the white barrel, and a second which changes the original colour of the Firefly to, loosely, the British Bronze Green colour. -icons for the Bronze Green version. These are entirely optional for using with the Bronze Green version of the Firefly. Oh, and to note, they do not actually include the white barrel on the icon. Sorry about that! Ok, ok, the previews. Here you go. 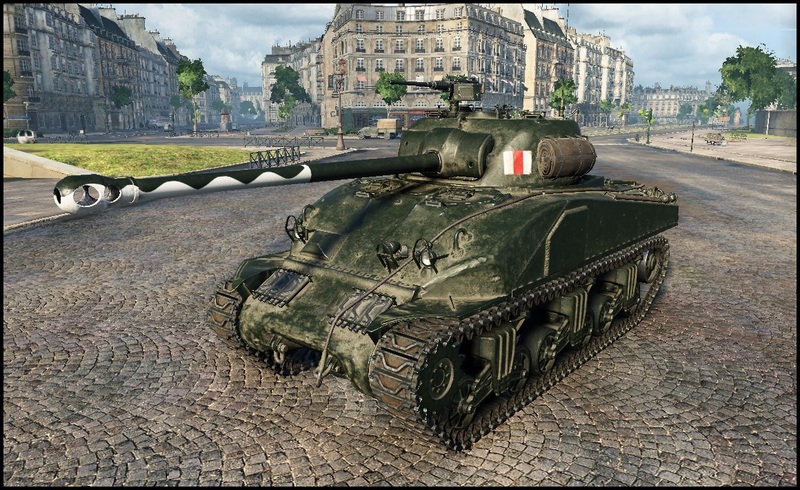 As was already posted above, the Bronze Green version of the Firefly affects the camouflages slightly. Courtesy of my former clanmate Strappster, here's a video showing how they make look slightly different. If you have changed any camouflages using my camouflage mod (linked here), they may be changed even more drastically. Anyway, I think that's that. If not, too much. I'm sure everyone viewing this just wants the download now, so here it is. Ok, a quick delay first: DO NOT UNZIP THIS INTO YOUR WORLDOFTANKS FOLDER. Unzip it into downloads, or your documents, or wherever you find best. Just do not unzip it to WorldOfTanks. There's instructions both in the pack and below, I'd suggest reading those first! I'm putting a bit of trust into everyone here to read those, so here's the link. Just make sure you read the instructions. Depending on what you'd like (the icons are optional if you're using the Bronze Green Firefly), just open the WinRAR File and then open the folder inside (which should just be the same name as the file, as another reminder as to which one you're viewing in case you've accidentally opened the wrong one). Inside each folder there should simply be a folder called "res_mods" (which, inside that is 0.9.15.0.1, so on and so forth. If the patch number changes, and I'm saying this without properly knowing so don't 100% Quote me on it, so long as the Firefly itself hasn't been touched it's probably safe to just rename this folder to the next patch number i.e 0.9.15.2 or whatever) which you merely have to extract to your World of Tanks folder, as shown below. I hope I've explained that in a good enough way. If there's any issues, please notify me either with a post here or through PMs. Additionally, this is only part of a larger mod I'm working on. Look forward to that, whenever I finish. Edited by Desyatnik_Pansy, 10 February 2018 - 08:00 PM. Still seems to work with 9.15.1. Like with the camopack, if there are any problems, please let me know. Updated version to make the tracks on the hull "less green" added to the OP, in line with an upcoming update for my full Bronze Green British tanks pack. Per the usual, if there are any problems please let me know! EDIT: Updating it a second time just to rename the folders in it to 0.9.15.1 Since I forgot to switch them since the patch. Sorry for that! Edited by Desyatnik_Pansy, 09 August 2016 - 01:43 AM. With the micropatch today, it looks like the mod works fine. All you have to do is move it into the new 9.15.1.1 Folder, or rename your existing folder to that. If there's any problems beyond that please let me know. Higher resolution (right term?) barrel paint is finished. The download will be up shortly for that, just gotta redo the preview shots, so here's some screenshots of what it looks like now. Oh, and don't worry, I didn't forget to update it for the original Beige colour either if you prefer that. Download in the OP Updated, and here's another just in case. Due to the increase of the guns texture from 512x512 to 4096x4096, expect the download to probably be a lil' bit bigger, but it shouldn't be much of a problem in-game. If it is, please inform me, because this is my first time trying something like this and I have NO idea how it'll affect performance. Additionally, the usual, any problems otherwise please notify me. Otherwise, enjoy! -updated Bronze Green Firefly to match the new, updated version in the full Bronze Green pack. Additionally, improved the appearance of the camouflaged barrel for both the Bronze Green and Original Beige versions. You can download from the link above, or the updated link in the OP. As always, if there are any issues, please inform me. Otherwise, I plan to perhaps further experiment with this by making it so the camouflage does not overlap the painted barrel, though I'll see how that goes since I use Paint.NET and well, I haven't a clue how to do that at the moment. EDIT: Preview images for the Firefly with Camouflaged Barrel now updated. Edited by Desyatnik_Pansy, 04 November 2016 - 02:52 AM. Like I said, I'll probably do a lil' bit more work as I don't feel it's perfect just yet and you'll especially note that the British icon is missing at the moment, but yeah, anyone interested? EDIT: Done. I'll be probably updating this later if I get the chance. Edited by Desyatnik_Pansy, 05 November 2016 - 10:27 PM. 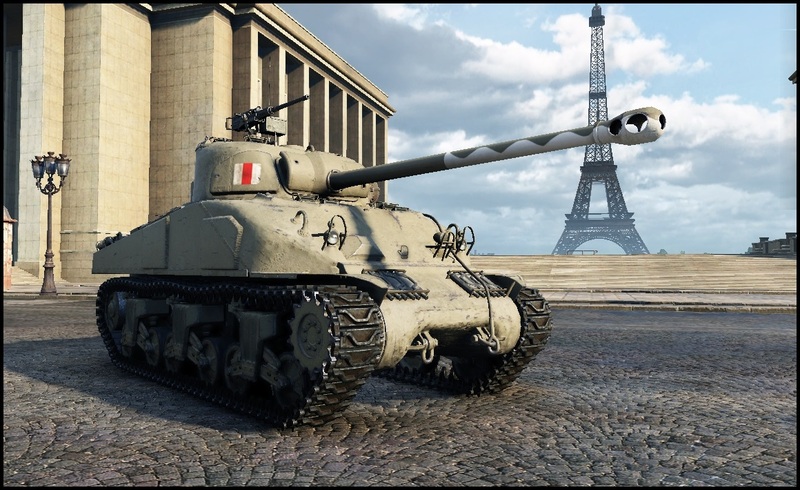 Sherman Firefly with Camouflaged Barrel updated again, with an Optional Marks of Excellence Reposition so that they no longer overlap the painted barrel. Really no point posting the Update Log quote since it literally just says exactly that, so here's just the preview and the new download link. If there are any issues please tell me. I owe credit to KiloRock (RU) and starfkr for this update. EDIT: I'm ashamed to admit but I've only just noticed that the version folder inside of the Bronze Green icons zip is still named 0.9.15.1.1. For most this shouldn't be an issue as they knowingly just rename it to 0.9.16, but I still feel bad for not fixing that. I'll fix it later tonight when I get the chance, again, sorry! Edited by Desyatnik_Pansy, 06 November 2016 - 12:07 AM. With the 1.7 Update (a la, 9.17.1 Update basically), camouflage applied to the vehicle now no longer overlaps the barrel paint and also applies to the Chassis model. The Bronze Green skin for the Firefly has also been revamped somewhat. Other than that, enjoy, and inform me of any issues. I just make the grind for take the firefly so your skin is welcome ! So with the 9.18.0 Update, I've modified the Chassis camouflage a bit. Thanks to Strappster, I have a preview available, showing that the camouflage to darker and more "damaged/faded". If you preview the original, well, feel free to say.